A leaking basement is never a good sign and it usually costs a lot of money to fix it once its ruined. Here’s a few tips to help basement leaks. Keep the Water Leaks Away! When the snow is melting and rain season it is great for nourishing your garden says Local Records Office, but not so great if the weather is below and freezing. These simple preventive measures will help keep your property dry from the bottom up. When you have clogged gutters and over flowing water around you foundation remove any plants and debris left over from the past season(s), then instal leaf guards and good downspout extenders to direct the overflowing water elsewhere. The downspout extenders should direct the water away from the home. Something to always keep in mind is to make sure that the surrounding soil is pitched away from the house at a slope of at least 1/4 inch per foot so that water drains toward your grass, not your foundation. Simply add soil, raking it smooth, until the grade is highest at the house’s perimeter. These are simple steps that anyone could do. Believe it or not some tress have massive roots that could destroy your foundation, specially tress like white oak tress and big tooth maple should be kept at least twenty feet from your homes foundation. Preventing basement leaks is not always an easy task but keeping up with will safe you money on the long run. 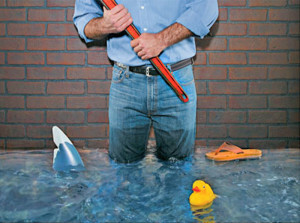 Basement leaks is one of the top causes of foundation damages caused world wide. Neglecting the source of the problem could cost you lots of money to fix and repair things that could of been done in the beginning. If you have a big tree next to your house you may want to check where the roots are growing to prevent damage. Basement leaks from rain and over grown tress could be prevented if you do something about it in the first stages. In some cases the water will and moister will make its way into the house and will damage the drywall and floors.